This third book in the Series of Unfortunate Events gives us the amusing Aunt Josephine and her endless phobias, plus a very funny unmasking of the ubiquitous Count Olaf. One invention of Violet's stretces credulity to the limit, and a bit beyond, but otherwise, a worthy addition to the series. 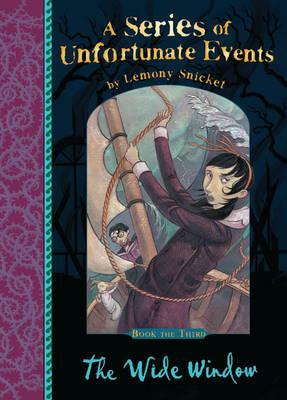 In The Wide Window, the third installment of Lemony Snicket's A Series of Unfortunate Events, the Baudelaire children are taken to live with a distant relative of theirs who lives in a house precariously hanging over a cliff above a giant black lake. Their relative, named Josephine Anwhistle, or Aunt Josephine, has a strange condition of being constantly afraid of everything, including Lake Lachrymose, which the house presides over. Due to her nonspecific fear, Aunt Josephine lives in a unusual way, such as never using the phone for fear of electricution or never heating food for fear of a fire. Aunt Josephine takes the orphans to get food for the evening, but while there, she meets a man the Baudelaires know all too well. Count Olaf, disguised as a sailor with one leg and an eyepatch. Aunt Josephine is sympathetic to Olaf's leg, seeing as her husband died in such a fashion, and she refuses to believe the orphans when they tell her that Captain Sham is actually Count Olaf. They leave Captain Sham on the docks on after they warn Aunt Josephine that Hurricane Herman is on the way. Later on in the evening, Count Olaf calls and Aunt Josephine works up the courage to answer it. She is threatened by Olaf so that she throws herself out of the large window in her library and into the murky lake far below. The orphans find a message from Aunt Josephine telling them that they are to be given to Captain Sham as their guardian. They go seeCaptain Sham and Mr. Poe, their banker, at the Anxious Clown to discuss legal matters. In order to find more time, the Baudelaires eat the peppermints given to them by Mr. Poe, which gave them a terrible allergic reaction. They go back to the house to find anything that may have led to Aunt Josephine's death. Klaus deciphers Aunt Josephine's message that really tells them that she is at a cave on the other side of Lake Lachrymose. Then the Hurricane hits and the house falls into the lake just as the children leave it. They sneak down to the docks and steal Captain Sham's boat and go to find Aunt Josephine. They sailed across Lake Lachrymose in the middle of a hurricane and found Aunt Josephine cowering in a cave. She was so afraid of Count Olaf that she wouldn't leave the cave, until they told her it was for sale and realtors would be coming around soon, whom Aunt Josephine fears more than anything else. They started to sail back across the lake, but before they could return, they are attacked by the Lachrymose leeches, and the boat begins to sink. Before they are eaten by the leeches though, they are rescued by Count Olaf, who promptly pushes Aunt Josephine into the lake where she is eaten by the leeches. The orphans try to save her, but Olaf sails away. Upon returning to the dock, Mr. Poe is waiting for them. Sunny Baudelaire reveals Olaf for his true identity by biting of his fake peg leg and showing his eye tattoo. Olaf and his henchmen run away again before the orphans can catch them and are once more left alone. this is better than the first two books! read it!